Japan's police agency says the death toll from the earthquake and tsunami two weeks ago has topped 10,000. Police say 17,400 are missing. 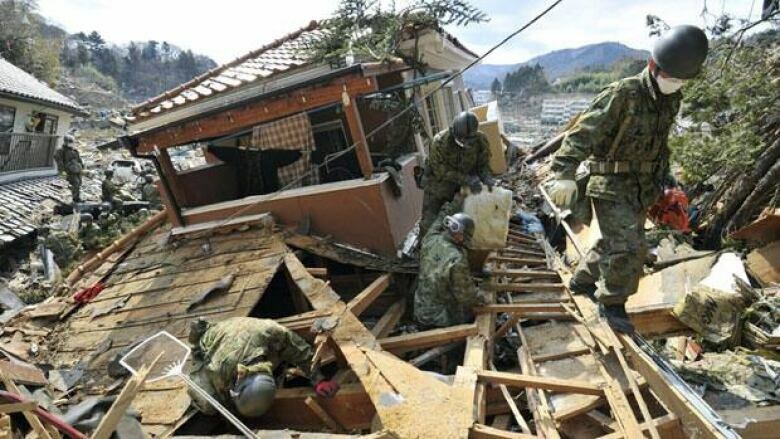 Japan's police agency says the death toll from the earthquake and tsunami two weeks ago has officially topped 10,000. The National Police Agency said as of 11 a.m. local time Friday, 10,035 people had been confirmed dead and 17,443 people are listed as missing. Police say there could be overlap between the two figures. Japan's worst calamity since the Second World War injured thousands of others and displaced hundreds of thousands when tsunami waters swept away entire towns. The March 11 quake and resulting tsunami have also led to an ongoing nuclear crisis and radiation scare as technicians struggle with the crippled Fukishima Daiichi power plant. on the country's northeast coast. On Thursday, nuclear officials say two workers were taken to hospital after stepping into contaminated water at the Fukushima power plant. Fumio Matsuda, a spokesman for the nuclear safety agency, said the workers were injured while laying electrical cables Thursday at Unit 3 of the Fukushima Daiichi plant. The two men were exposed to radioactive elements on the skin of their feet. The workers likely suffered "beta ray burns," said a spokesperson for plant owner Tokyo Electric Power Co., citing doctors. Officials said about two dozen people have been injured since the plant began leaking radiation after suffering tsunami damage March 11. The tsunami engulfed its cooling systems, leading to explosions and fires in four of its six reactors. After setbacks and worrying black smoke forced an evacuation Wednesday, workers were back to work Thursday, said Hidehiko Nishiyama of the Nuclear and Industrial Safety Agency. The overall situation at the Fukushima plant remains of serious concern, the International Atomic Energy Agency said. The deposition of radioactive iodine and cesium varies across 10 prefectures on a day-to-day basis, but "the trend is generally upward," said Graham Andrew, senior adviser to IAEA chief Yukiya Amano. Nuclear workers have struggled for days to stabilize and cool down the overheated plant. "As of now, the important thing we have been working on is to prevent deterioration. We should not be too optimistic," Edano said. "We are moving cautiously." Officials have evacuated residents within 20 kilometres of the plant and advised those up to 30 kilometres away to stay indoors to minimize exposure.